by Calling Out Community, Posted August 4, 2015. Updated September 15, 2015. I highly recommend a documentary called “Hijacking the Holy Land” on DVD. Happened to see it at our local public library, and I thought it would be some militant leftwing, anti-Israel garbage – but was still curious enough to borrow it. It’s not like anything I’ve ever seen before. I’m going to have to watch something else now today or I won’t be able to sleep. It’s not some sappy or preachy “God loves Israel” thing. It’s shows very graphically just what Muslims actually teach and believe. No not the extremists – ALL of them. They WANT us to believe they are peace loving people like us. I’ll never believe that again. They are our biggest enemies. It’s extremely graphic and I’m glad – when you read the English words of what they are saying I think your mind shuts down. I still thought they had to be making this up. But when I saw 5-10 year old kids at rallies singing songs about burning America to the ground and destroying Israel, I started to get REALLY angry. There’s no way to make peace with these people. There’s an “Arab Friendship Centre” down the street from me. What a crock. Do they think we, their neighbours, don’t recognize that not a single non-Muslim ever enters that building? It’s quite possibly a front for some locally-bred terrorist group. They don’t want peace or to be our friends. Shariah law identifies us as “infidels” if we don’t believe in Islam, and as a result, the penalty we pay is for them to round us up and cut our heads off. And in case we think that mindset only exists in some ISIS- or Boko Haram-held stronghold in some backwoods somewhere, the documentary shows clips from a recent Muslim rally in TORONTO. Their comments about Canada and the United States sickened and angered me to the point, that I can now see where militant belief comes into play – I wanted to blow up the whole place up after I saw what they said. Christians are incredibly naive. We have the most unbelievable enemy with the most wicked ideas flooding into our country and we don’t realize it. They don’t tolerate us. They don’t ‘live in peace with us’. They just want a world free of Jews and Christians. Let’s get real for a moment. In the Middle East, Muslims don’t care about an independent Palestinian state either. Muslims don’t care about Palestine. If a Palestinian ever tries to go to Egypt or Jordan and claim refugee status, they are denied. The Palestinians’ biggest trading partner is not an Islamic nation, it is Israel. For all their whining and complaining on the world stage about how evil Israel is and how persecuted the Palestinians are, not one Islamic country even lifts a finger to provide the “assistance” they claim the Palestinians need. And it’s difficult to see what need the Palestinians actually have, when you walk through their settlements and see that every home has a satellite dish, every person a cell phone. In Syria, millions of people are living in the desert because of the Civil War there. Do you think that any Islamic countries providing food, emergency supplies, etc. ? NO – though the Syrian Arab Red Crescent (SARC) is doing exemplary work in Syria, and 34 SARC volunteers have lost their lives since the beginning of the conflict in Syria, all of them killed or captured while carrying out their humanitarian duties. They were all clearly displaying the Red Crescent emblem, which should have given them protection under international humanitarian law. In the first 6 months of 2015, in concert with the Red Crescent, the International Red Cross has fed 4.6 million people, provided health care for 32,000, and provided safe, clean drinking water – for 16 million people. In the Tweet shown here from on August 4, 2015, they stated that in south Damascus alone, the capital of Syria, they provide daily bread for 160,000 people. That’s incredible. Even the Israeli Defence Forces are assisting in the Syrian crisis, by treating more than 1,400 people wounded in the Syrian Civil War at one of their top secret hospital bases. But Muslims? They couldn’t care less about Syria either. The Arab League uses Palestinians to attack Israel daily without being accused directly of doing so – the gullible Palestinians play right into the Arab League’s hands. Presidents Carter and Obama are so totally anti-Israel, from sourced quotes about Israel that both have made, that I officially am sickened by both of them. Especially Carter, who’s such a good Sunday School boy on paper. His comments about Israel made me sick to my stomach. He’s just a stupid, liberal lunatic, anti-Semitic racist. Obama though is totally different. If you have not yet watched the documentary Obama 2016, you must do so as soon as possible. He’s not suave or cool or hip. I see beyond that, to a man who could be entirely EVIL. I believe he is working hard every day toward the total destruction of the Unites States economy ON PURPOSE and Obama 2016 will blow your mind on that. If his actions do not have evil intent, then he is by far the most incompetent President in American history, and should be arrested, tried and jailed at best for his crimes against the American people, including racking up a $13 trillion on his own, 4 times more than all of his predecessor Presidents combined. And it grows by $2 billion a day, says the National Debt Clock. But this Hijacking video shows how Obama also wants a weak Israel – and he knows EXACTLY what that means if he stops supporting Israel enough. If Israel becomes just a little weaker, the 22-nation Arab League will take it as their sign to overrun Israel and slaughter all the Jews. Ridiculous, you say? They’ve already tried it twice – in the Arab-Israeli War of 1948, the Six Day War in 1967 and 1973 Yom Kippur War. If even one Jew lives, they believe they have lost. They don’t want peace with Israel – they want no Israel. Did you know, when Israel moved out of the West Bank and gave the land to Palestinians in a “land for peace” deal – the Muslims hated the Jews so much they tore down every building that a Jew had built. They would rather have slept outside for months than in a house owned by a Jew. And they began firing missiles – 10,000 of them in 10 years – from those lands that were rightfully overtaken by the Jews in the Wars mentioned above – wars that Muslims, not Jews, started in every case. And the Muslims call this a “Land for PEACE” deal? Islamic schools even teach that modern Israelis aren’t related to the Biblical children of Israel – they say that the children of Israel were ARABS – so that modern Israel would have no claim to Israeli land. It’s beyond belief. They teach that the Wailing Wall and Temple Mount are a fraud – Muslims believe neither Solomon or Herod ever BUILT a temple. They believe MUSLIMS built the Temple and the Jews STOLE it – again to teach their people to hate Jews for owning those sites today. You have to see this video. 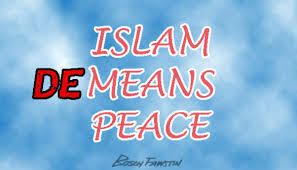 If you are one of the only leftwing loonies left today that still believes Islam promotes peace, when the Quran absolutely discredits that belief system, then watch this video simply to be informed about what the opposite side is telling. Along the way, however, you are going to see firsthand just how absolutely betrayed you have been in believing in these people in the first place.